At the end of February, my trustworthy backpack and I set off for new adventures in a continent that I have never set foot in. It was time to visit Africa, more precisely Morocco. Having been travelling independently for a good period of my life now I could feel the jitter within my body as I was throwing myself into an arranged tour. However, being unfamiliar with the culture, the language and simply lacking the time to do the usual inspirational-online-research, this seemed like an appropriate way to be introduced to a new fascinating world of Arabs and Berbers. For one week I exchanged the daunting company of my PhD thesis out with a loving bunch of Portuguese and Brazilians. It was wonderful and I brought back so many memories, good laughs and unforgettable sights which have been permenantly burned into my heart and onto my retina. & that's good cos halfway through the tour my camera broke (heh). Arriving in Marrakech I was initially greeted by its quiet and neatly organized neighborhoods. The streets were straight and lined with orange trees. Things started however to change as we passed the walls encapturing the old part of the city, the Medina. I now felt the puls of Marrakech. A beat pulsating more vibrantly the further we went into the old city and that finally exploded at the very heart of the Medina. A friendly face, João Cajuda our tour guide, was awaiting us at the riad (Riad Dar el Masa) situated a few minutes walk from the busy center. Entering this traditional Moroccan house and sipping sweet mint tea among unfamiliar faces, it finally hit me: I was in Africa! 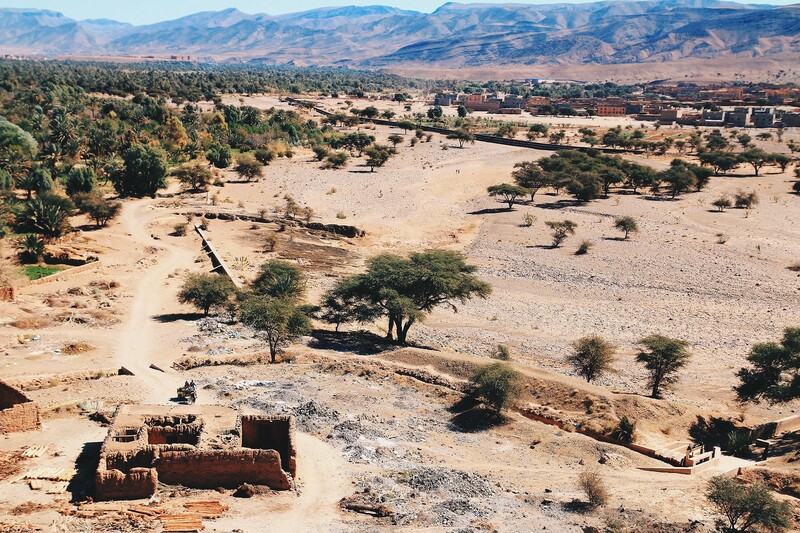 Overlooking the Draa Valley covered in two million palm trees. The first evening was spent at Jamaa el Fna, an enchanting market place and open-air theatre where vendors, snake charmers and medicine men are working side-by-side. The square was a festival of smells, noise and hefty activities. Gastronomic flavours hung in the air and steam drifted from the barbeques. Oriental music vibrated heavily through the market place and it seemed like all the hustle and bustle from earlier that day had suddenly amplified and were now raging on into the darkening hours. 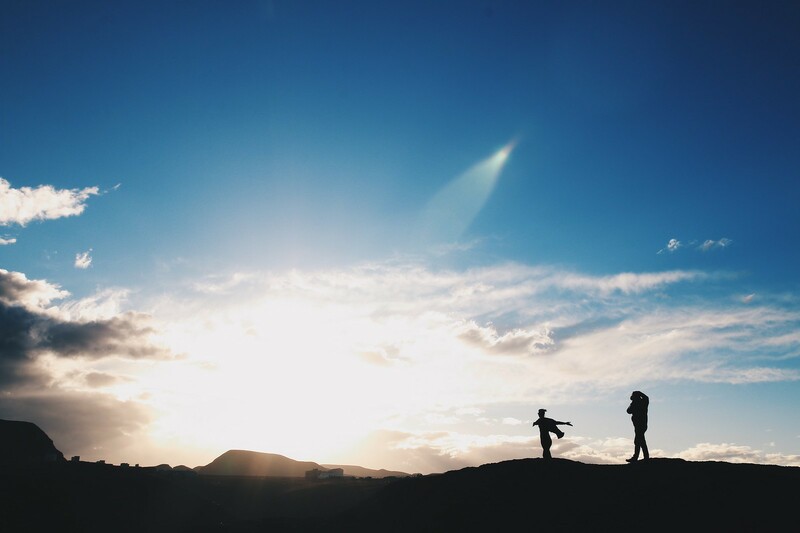 We didn't stay in the city for long as it was time to throw ourselves into the more rural and barren areas of the country. 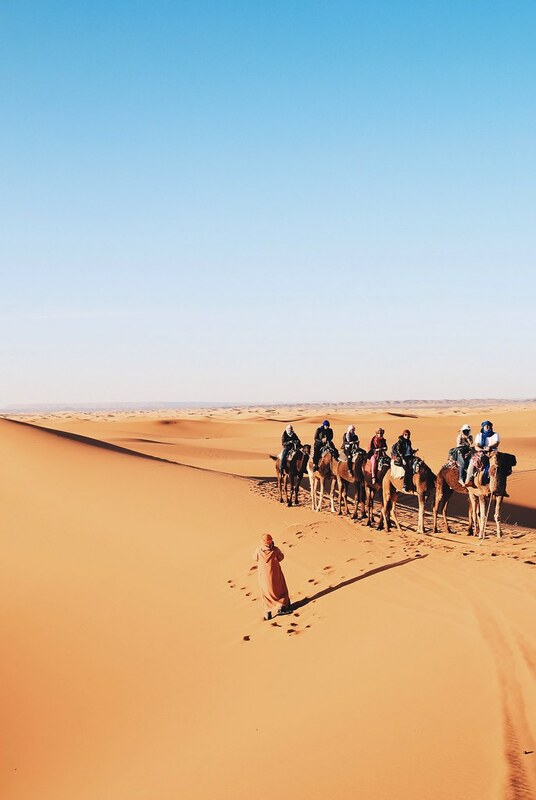 Morocco is a plethora of visual wonders witholding both man-made architectural marvels and natural pristine. The first day in Marrakech had introduced us to the former, now it was time to experience the latter. The next couple of days, numerous hours was spent on the road together with my dear roomie Patricia, my fellow-youngster Tatiana, the fun-loving couple Sónia and Eduardo, and João's quality taste of music serving as background harmonies for the Moroccan documentary being showcased before our eyes. 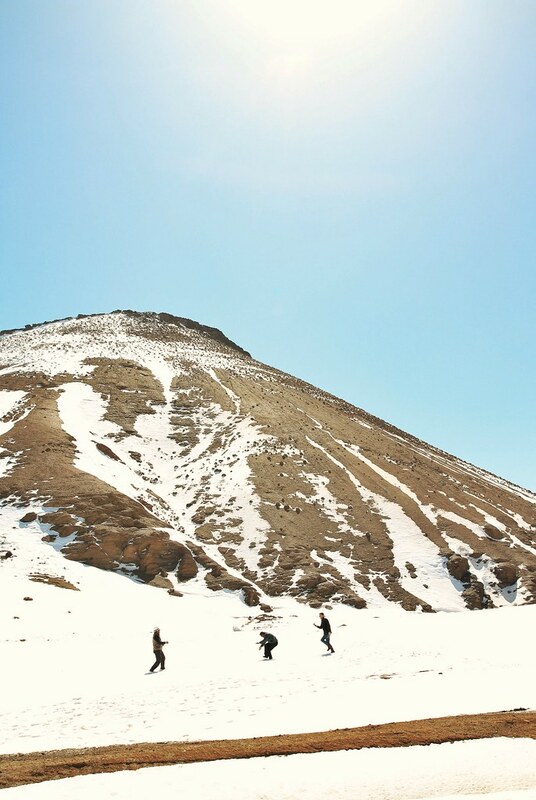 Soon we were crossing the Atlas mountains topped with ice-capped peaks and feeling the fresh cold air. We were lucky. 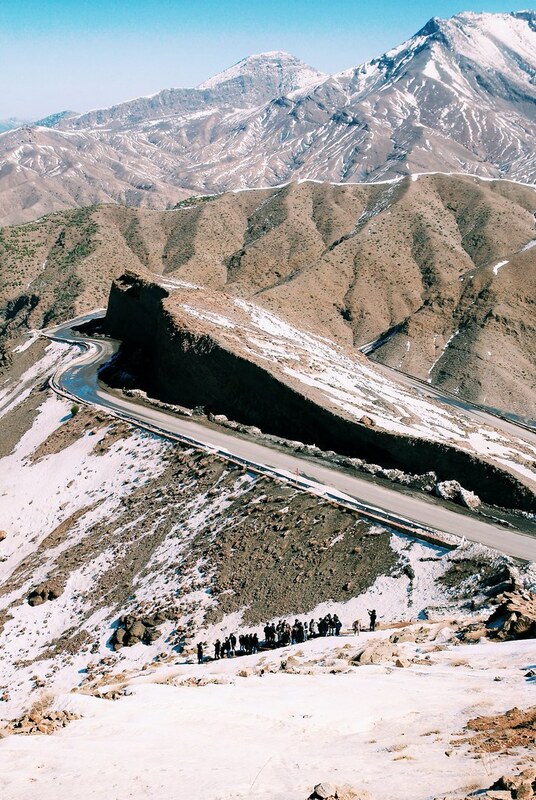 To experience the snow-covered landscape on our way to the desert truly emphasized that Morocco is a country of contrasts. The earthy hues of the landscape stood beautifully against the porcelain blue sky. 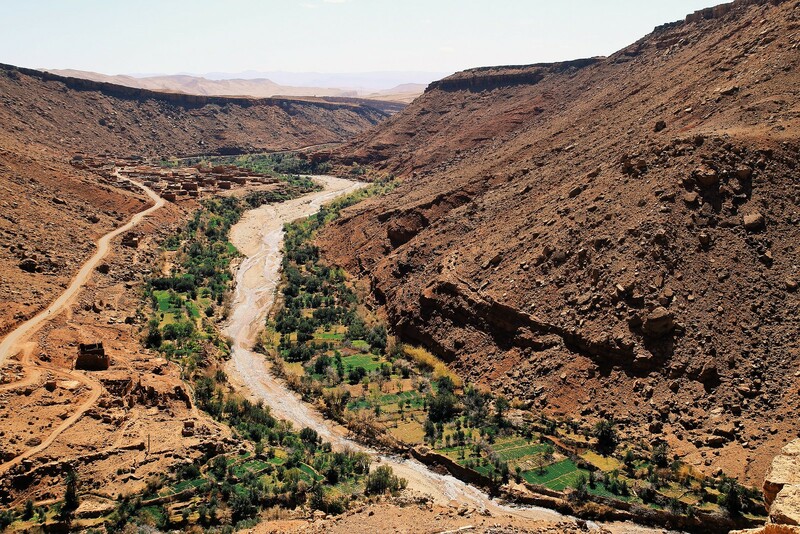 We took the old road through the Ounila valley which previously served as the main route over the Atlas Mountains. 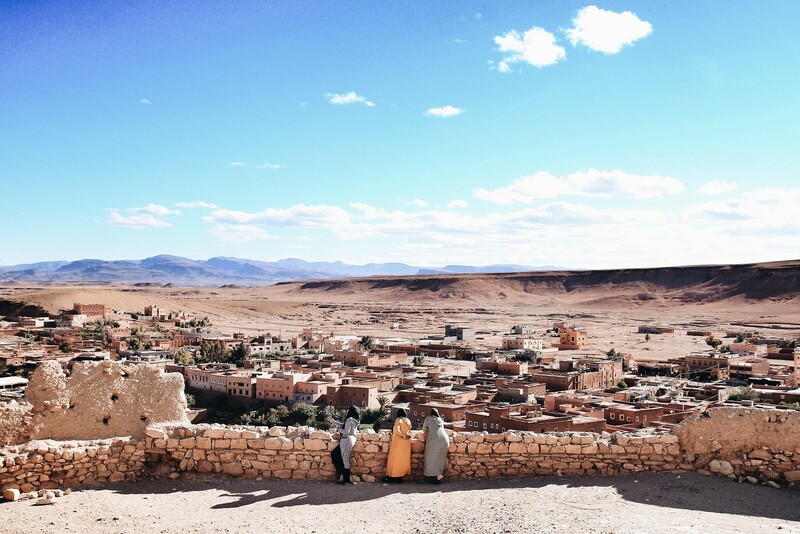 As we distanced ourselves from civilisation we passed through ancient mud-brick Berber villages lost in time as well as the fortified city Ksar of Aït Benhaddou. We ended the day close to Fint, an oasis village nicely tugged away behind mountains and tall palm trees. 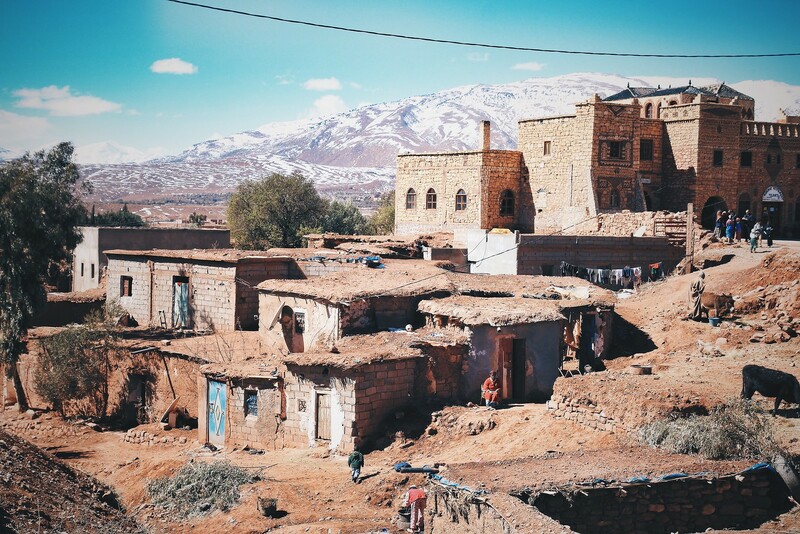 Here we sipped pots of sweet mint tea and listened to the drumming beats of berber music, which would become an every night tradition to mark the end of the day. 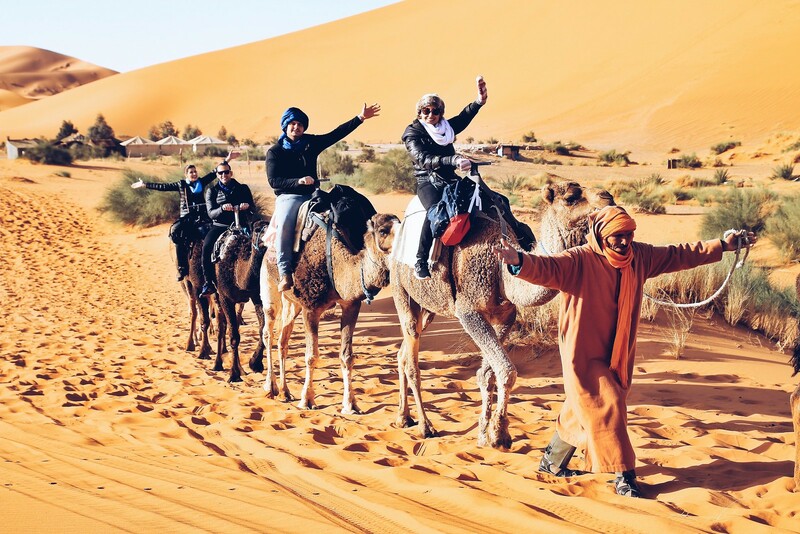 Reaching the Sahara desert requires at least three days to make it comfortable. We took it slow to enjoy the scenery, but still things seemed to be a bit rushed at times. Passing Ouarzazate we slowly transitioned from oasis to desert. 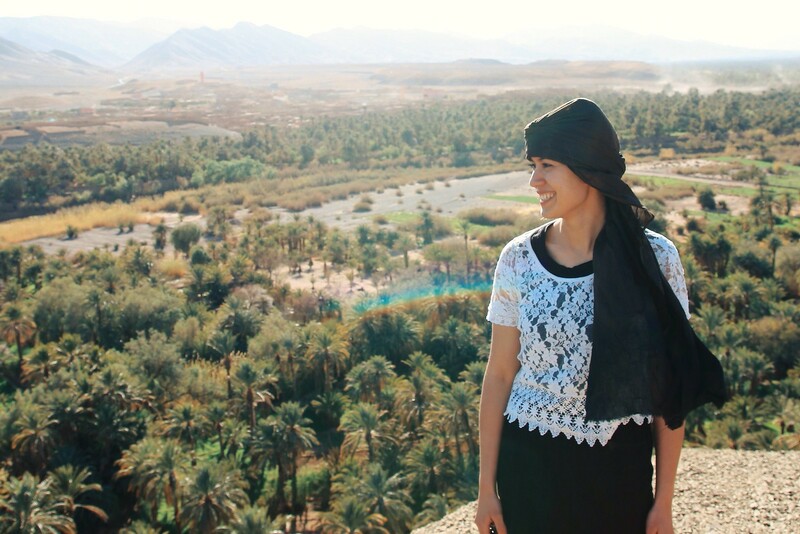 In the Draa Valley we stopped to climb a lookout point giving us a perfect panoramic view over the two million palm trees covering the area. Here at the top we were gifted with headscarf for the upcoming desert trip. 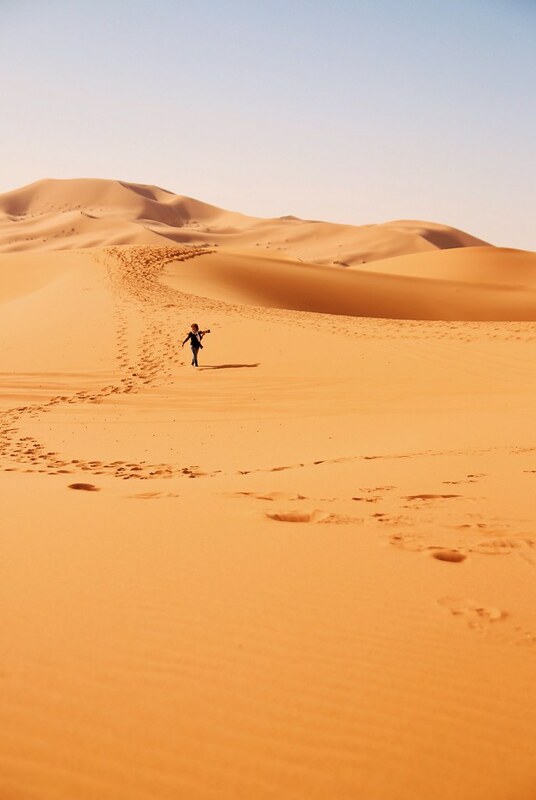 As we came closer to the Sahara desert, the cold were soon replaced with warmer weather and by time the sun had gently burned my face leaving it with a brown-golden touch similar to the landscape surrounding us. Late in the afternoon we arrived at the red dunes of Erg Chebbi. 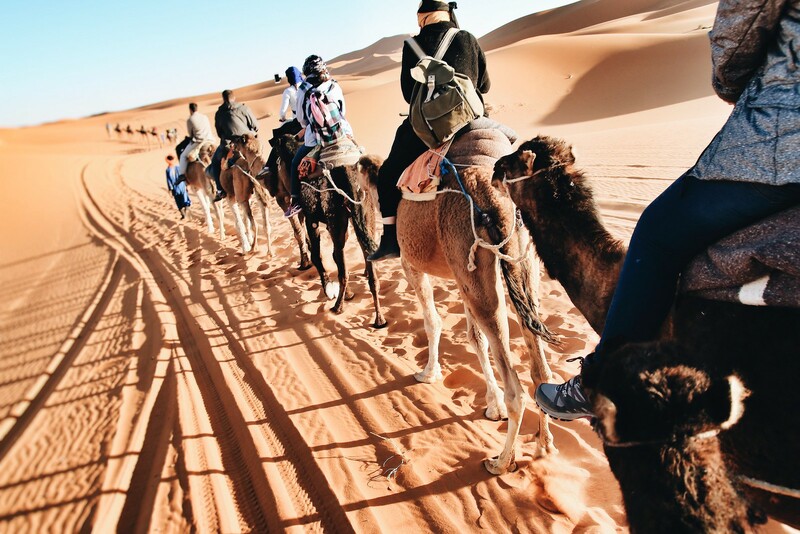 Camels were waiting to bring us to the berber camp hidden within the desert, where we would spend the night. The dunes were absolutely magical. Especially as the sun was setting and the sand took on different shades of red. Camping in the desert was the highlight of my trip and I was so enormously stoked to experience the sunrise - however, for some reason I missed it. NOOO!! Determined to get the most out of the experience I decided to walk back to the car instead of riding the camel. Iara (ClickIara) also went by foot. Being busy snapping pictures we slowly fell behind the rest of the group. It was perfect! We took our time and for once I felt a bit of freedom. The serenity and the extensive dimensions of this desolated sea of sand stood clear to me as we wandered through the dunes single-handedly only equipped with a sense of direction of where we were heading. Leaving the desert behind we gathered for a picnic with berber pizza at a secluded spot before heading on to the perfectly located desert hotel, Auberge du Sud. From the pool we had the most amazing view overlooking the desert. I was eagerly waiting for the sun to set, so we yet again could roam around in the red waves and catch a fiery sunset from the top of the dunes. The following day it was already time to head back. 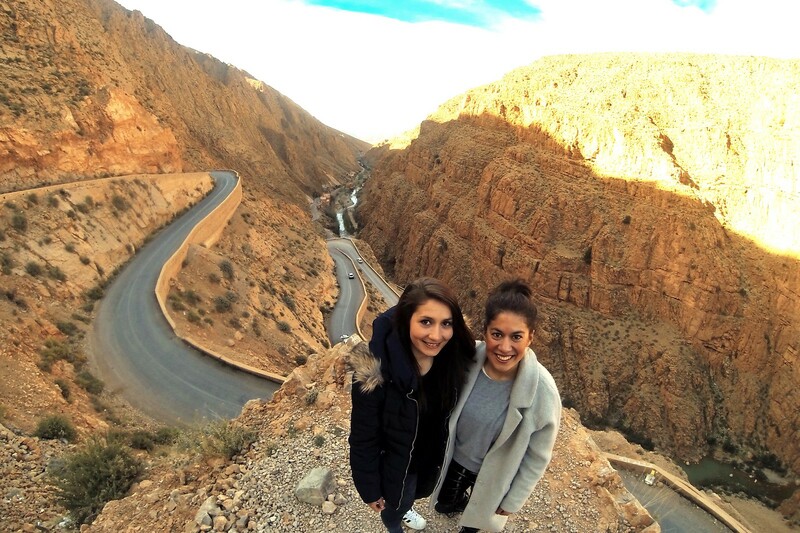 Returning to Marrakech, we stopped by the Todgha Gorge with its ashtonishing canyon walls as well as the iconic Kasbah Amridil in Skoura. The road was packed with Renault 4 cars which were heading home from the 4L Trophy rally. 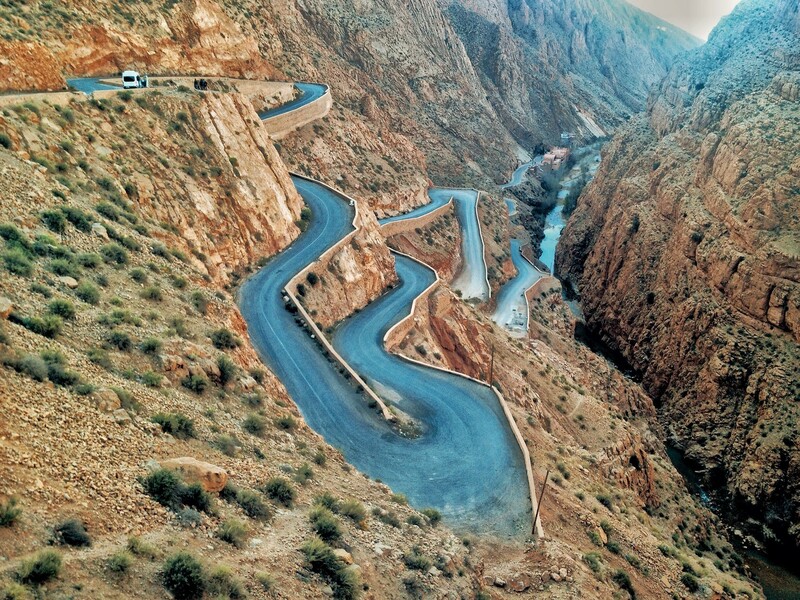 We zig zagged our way between the string of cars, on twisting mountain roads and through the spectacular Dadès Gorge while taking in the final sights, admiring towns of ancient kasbahs and the dramatic cliffs rising around us. The evening we returned back from our adventures, Marrakech smelled like Manila to me - that big city smell of dirt and rain. It made me smile and had me feel like I was returning home. It felt like yesterday that the 22 of us gathered for the first time at the market. On the final day we had time to roam around the buzzing city jungle of Marrakech. The Medina is truly an experience on its own. Getting lost in the narrow and maze-like streets, fighting with the Henna ladies and conjuring up smells of spices and leather are all part of the Red City experience. We wandered the crowded souk, where beams of light pierced through the sealing slats illuminating the dark alleys filled with persistent salesmen and fine Moroccan handycraft. Deep within where the skin and metal was prepared, the souk was wet and filthy. It stood in stark contrast to the otherwise colourful city. Marrakech is truly a splash of colours and intricate patterns that creates mesmerizing designs. I was especially captivated by the details of the old Islamic college "The Ben Youssef Madrasa" and simply enjoyed the doorways along the narrow streets. One thing I truly loved about Marrakech were the humble exterior of its riads. Only by entering you would see whether a simple or luxurious interior was hiding behind the door. We shared our last supper together at PEPE NERO - a perfect example of a lavish surprise located in a humble dwelling. Morocco has been a dream destination of mine for quiet some time now and this quick appetizer has only awaken my thirst, even so more. I want to come back to spend days at the desert and collect sandcorn between my toes, to escape into the blue city of Chefchaouen nestled in the Rif Mountains, to be appalled by the odors of the Chaouwara Tanneries in Fes and to connect with the Moroccan people with stories and smiles. Have any of you ever been to Morocco? And do you have a favorite spot that we simply need to know about? 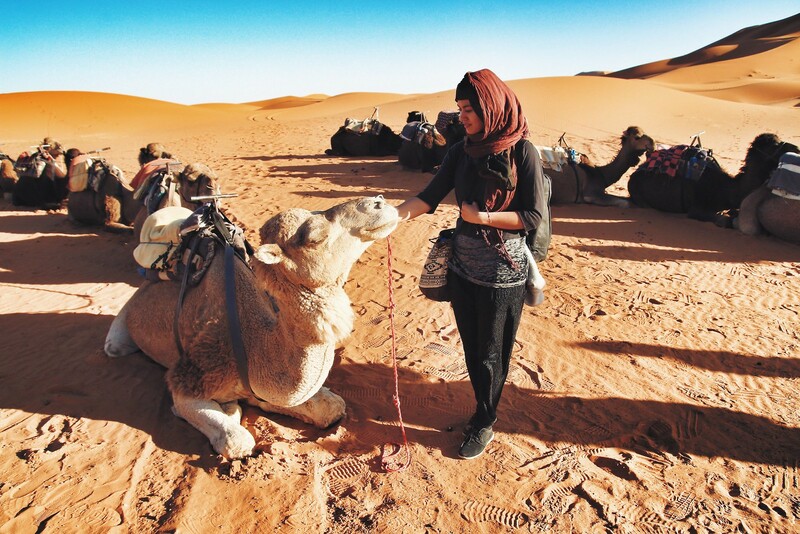 Go visit everywhereifeelathome by fellow traveller Rita, for more stories and photos. Finally, obrigada to Joao Cajuda who organized this tour in partnership with Marrocos.com. Smukke smukke billeder, og sikke en fantastisk oplevelse. Jeg har jo fuldt lidt med på Instagram og glædet mig til indlægget. :) Jeg elsker også jeres tekster, de er virkeligt fangende og oplevelsen super godt beskrevet. Jeg gad selv godt opleve andre dele af Marokko, min studietur gik jo til Agadir, som jeg ikke kan anbefalde (turistfælde), men bagved ligger de smukkeste bjerge (Atlas Kasbah) og hele området er kendt for argan olie, og det er muligt at komme ind og se kvinderne producere olien, og bo hos de lokale berber familier. Tak kære Marianne! Nogle gange er det også bedre bare at fokusere på nogle få steder end at fare rundt og se alting. Turen til Sahara er VÆLDIG lang, så når du endelig tager afsted, så sørg for at sætte god tid af. Der er så meget smukt at se på turen derud og hjem :-) Men ja, Sahara var en utrolig oplevelse! Det virker helt surrealistisk, når man star dér og kigger ud over den kæmpestore sandkasse!